Disconnect the wire your using from the amp and measure the voltage. Make sure it goes to 12V when the car is switched on. In the G, the amps power up anytime the start button is in the On or Assy positions. If the target wire shows the proper voltage switching, its likely the amp turn on circuit is drawing more current than the head unit will source. You'll have to install a slave relay in this case. 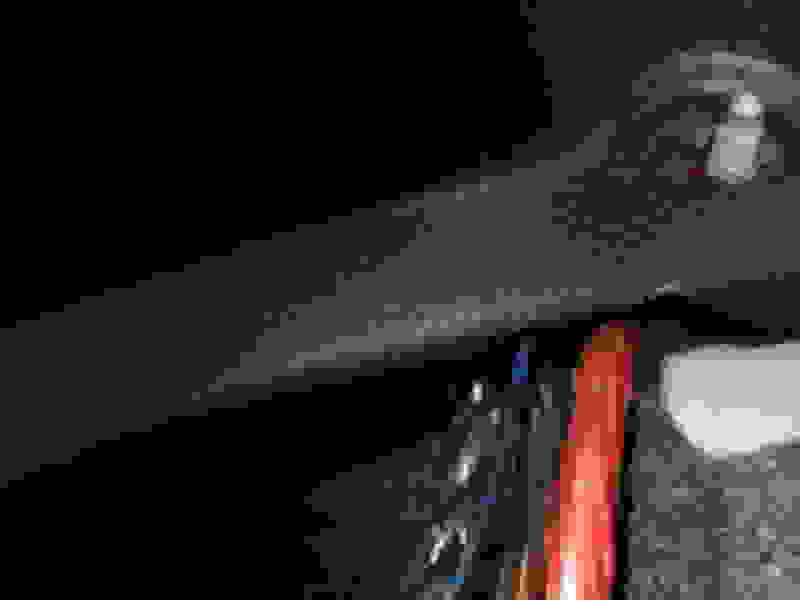 hey guys new to this site and need some help. I have a 2010 coupe and followed this diy to install my RF 3001 amp and rf p3 sub. I tapped into #3 for remote power and got nothing to the amp. I took it all apart and put it back to the way it was and now my rear speakers are not working. I checked the fuses for the bose amps and they are both good. I have no power coming from #3. I just wanted to add how I installed my amp as I think it turned it out really clean. 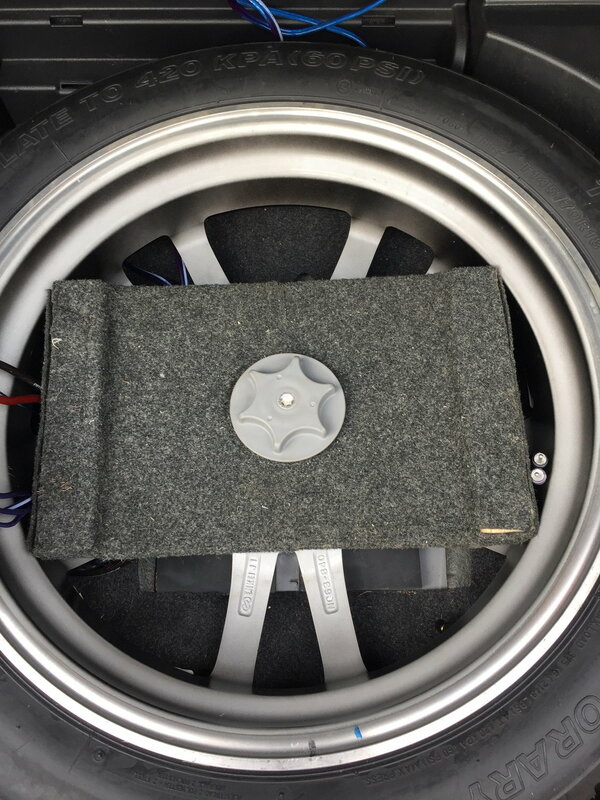 So I mounted it in the spare tire, removing the foam thing in there and making a custom steal plate to mount my amp. 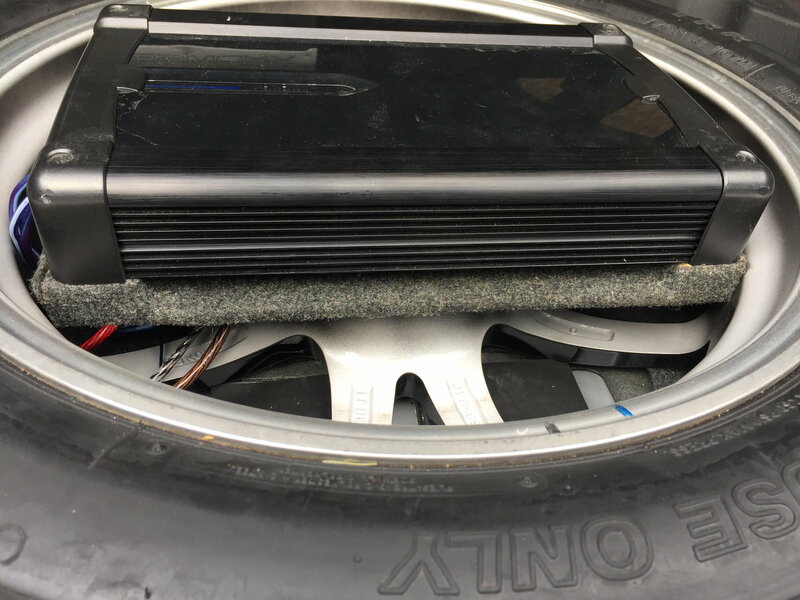 I ran the wires under the tire and store everything in the left plastic compartment, I had to cut a little notch in the plastic to run the wires through. 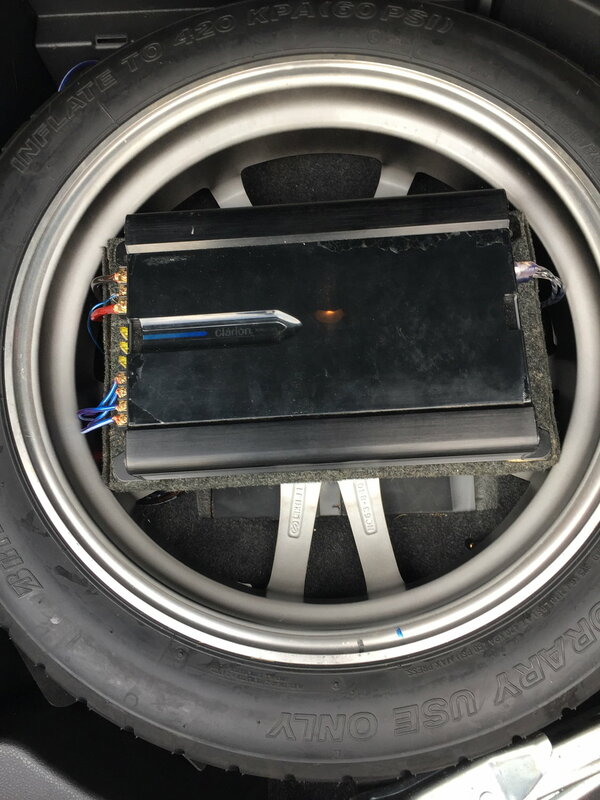 I also had to grind the plastic screw thing down that holds down the spare tire so it would fit under my amp. Yaya I know it doesn't get any airflow under there and was strongly recommended not to install my amp there or install a fan, but I have not had any troubles with my amp located under the trunk liner with no fan installed for 1 year. Did this last year using a LOC, and always thought it was not working as good as in my previous vehicle. After reading all these forums, I ripped my trunk apart and am going to wire my RCA's directly to wires 23-26. 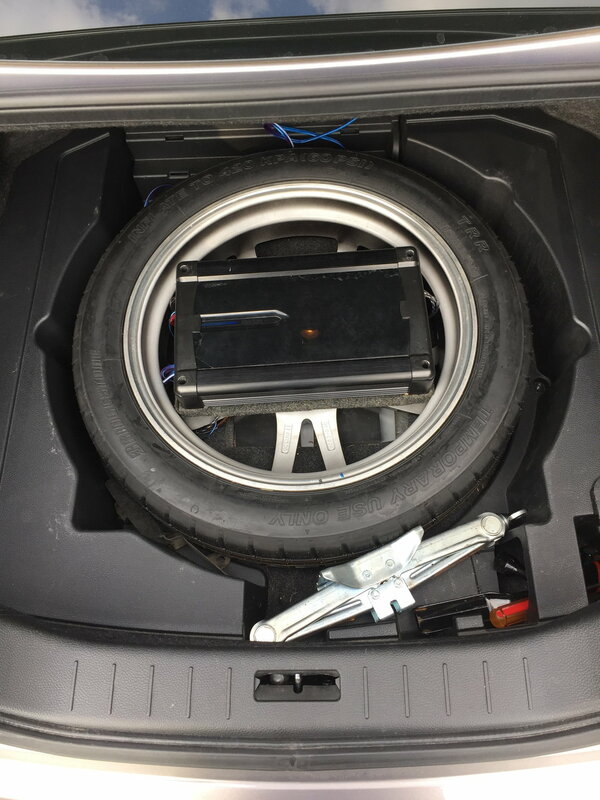 Amp sits relatively flush with the spare tire, maybe slightly higher but the trunk liner just sits on it. 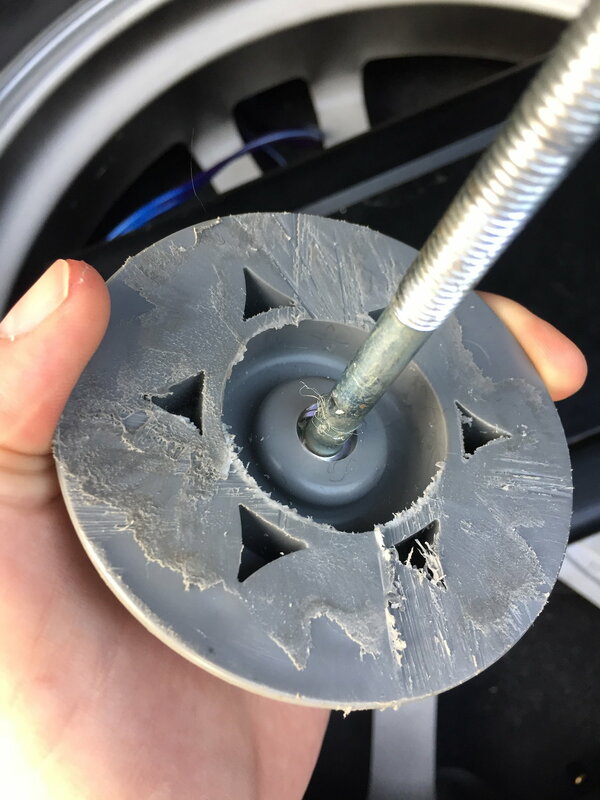 Bottom of this plate is steel, custom made with screw holes in the sides so I could screw wood to it, and one hole in the middle so the spare tire is still held down. notched out a small slot for all the wires and hid everything beside the factory amp. Hey I may be bumping an old thread but I did this exact same setup on my 2008 Infiniti G37s Coupe. 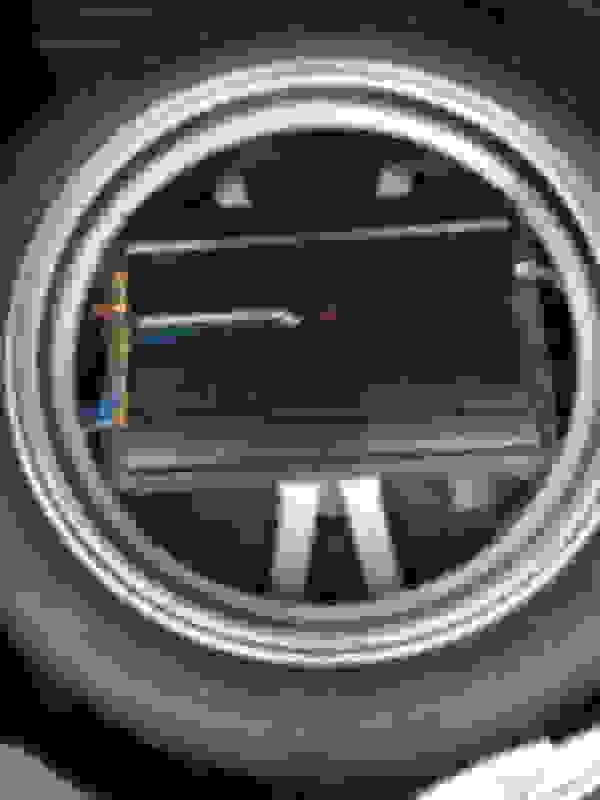 It's giving this loud engine/whining noise coming from my subs. Even with a slightet turn on the gain. It literally sounds like an exhaust when your driving around and its ruining the quality of the sounds. Any idea on what is causing this? I grounded my amp next to the factory amp and used the dual RCA instead of a single connected to a Y Splitter if that helps..
Did you use a LOC and what wires did you tie into? Tweeter Pods or A-Pillar mod?